Not all sandwiches are packed with enough protein to fuel your gains come midday. Here are the 5 best bodybuilder-friendly choices. For a majority of people, the mighty sandwich is still the go-to choice for lunch. Some choices are better than others, especially when it comes to introducing chemicals and added sodium into your diet. If you're stuck in a ham-and-cheese rut, rest assured there are other great options out there to stack up your muscle-building proteins, each offering an opportunity for a more adventurous midday meal. No bologna; these sandwich fillers are a cut above the rest. There's a boatload of reasons why you should get your stink on when it comes to sandwiches. A favorite protein among Scandinavians, who often make it the star of open-faced sandwiches, pickled herring is mega-healthy due to its abundance of omega-3 fatty acids. Beyond being vital for a strong ticker, studies show that omega-3s can help dampen muscle soreness associated with working out. Herring is also one of the few foods that deliver a good amount of vitamin D.
A 2014 study in the "Journal of Science in Medicine and Sport" found that subjects with higher intakes of vitamin D experienced increase upper- and lower-limb strength. It's believed that muscles have receptors for vitamin D, and require this nutrient to function properly. Further, pickled herring is low in potentially toxic contaminants and easy on the wallet. Stack This: Stir together cream cheese, chopped fresh dill, drained capers, lemon zest, and black pepper. 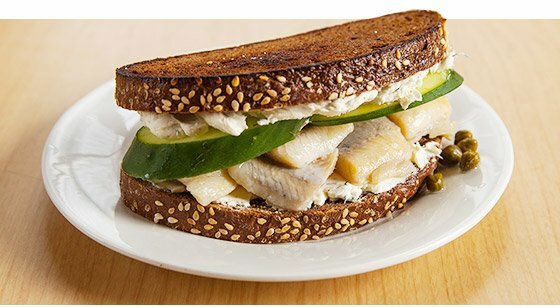 Top slices of toasted dark rye bread with cream cheese mixture, pickled herring, and sliced cucumber. Often one of the most important ingredients in a sandwich is time: hence, our love affair with deli meat. But nearly every supermarket has roasted whole birds for sale you can also use to stuff your sandwiches with quick protein. The only work on your end is to pull off the juicy, seasoned meat. Each ounce of rotisserie chicken supplies about 8 grams of protein, and is a good source of niacin, a B vitamin that's needed to convert the food you eat into the energy you use to bang out sets of bench presses. If you're concerned about fat calories, remove the skin. Stack This: Stir together Sriracha hot sauce with olive oil mayonnaise. 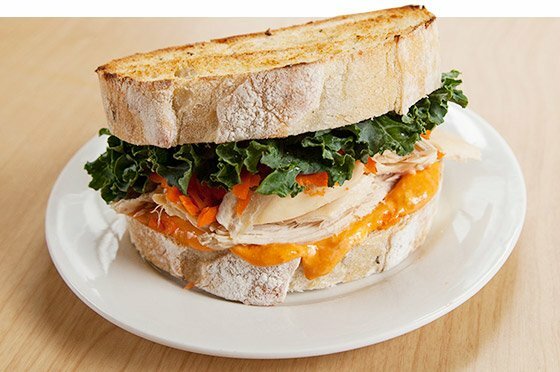 Slather Sriracha mayo on bread and top with slices of rotisserie chicken, grated carrot, and baby kale. When it comes to deli meats, many people still think that roast beef is a fat bomb. Yet with only about a gram of fat in each one-ounce serving, there's no reason to have a beef with this deli option. As with other red meat, roast beef provides top-notch protein and a dose of energy-boosting iron as well as some creatine, the famed compound shown to bolster muscular power. 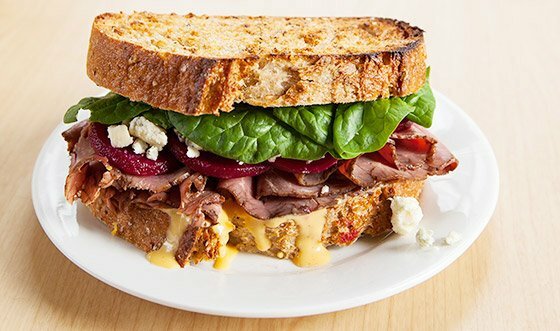 Stack This: Slather honey mustard on bread and top with slices of roast beef, gorgonzola cheese, pickled beets, and baby spinach. When it comes to sandwich meats, consider pigging out on smoky black forest ham. Not only is it more flavorful than ho-hum deli turkey or chicken breast, but this ham has an impressive protein-to-fat ratio of 10:1, making it particularly muscle-friendly. Another perk is that it contains less sugar than honey versions. 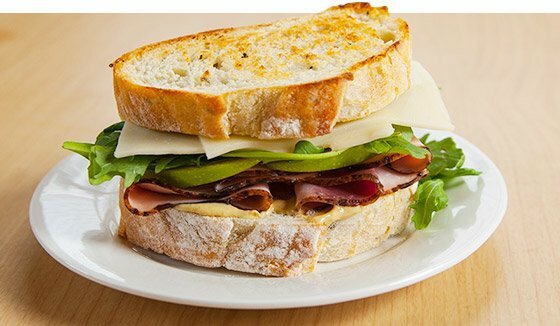 Stack This: Spread Dijon mustard on bread and top with black forest ham, Swiss cheese, slices of tart apple, and arugula. 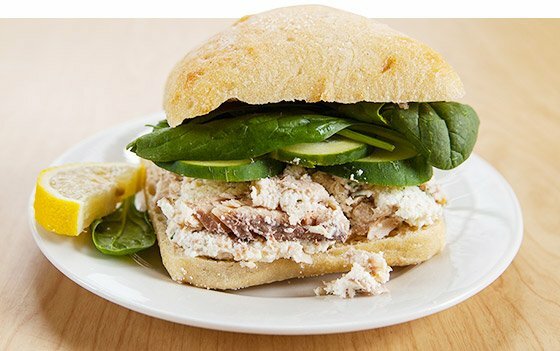 Smoked salmon is a great catch of the day for sandwiches, but consider reeling in smoked mackerel as well. Ready-to go smoked mackerel has a rich flavor, plenty of protein, and a huge amount of omega-3 fats—1.4 grams in a single-ounce serving. Researchers at Washington University School of Medicine in St. Louis, Missouri, found that these phat fats can rev up muscle-protein synthesis, making mackerel muscle food indeed. What's more, mackerel is laced with selenium, a mineral shown to improve mood, meaning a mackerel sandwich may help keep your spirits up on the gym floor. As bonus points, this swimmer is considered one of the most sustainable options at the fishmonger. Stack This: In a bowl, stir together chunks of smoked mackerel, ricotta cheese, prepared horseradish, chopped fresh dill, and lemon juice. Dollop on bread and top with cucumber and baby spinach. Ok, it's not meat, but these steaks of the vegetable world add a meaty bite to sandwiches for a nice break from an animal-focused lunch. Studies suggest that compounds in these edible fungi can charge up a healthy immune system. 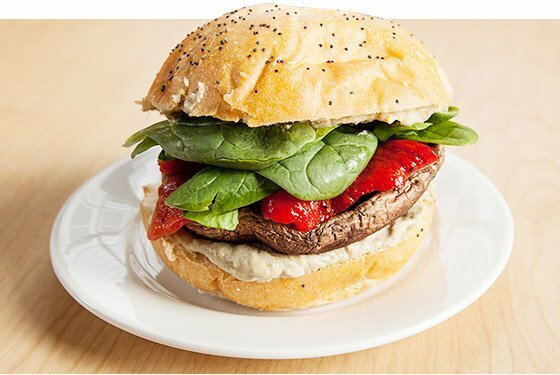 At a mere 40 calories apiece, portobello mushrooms are also a great sandwich option if you're trying to lean down. To prepare, simply snap off the stems, then roast in the oven until tender, or place the caps directly on the grill. You can keep cooked portobello mushrooms in the fridge for up to three days. Stack This: Mash together avocado, Greek yogurt, and lemon juice. Spread avocado mixture on bread and top with prepared portobello caps, roasted red pepper, and baby spinach. Some varieties of rice better fuel your energy needs and your health than others. Here's what you need to know about your best choices.